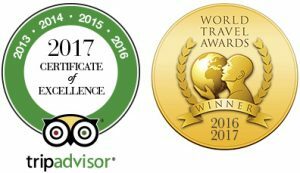 Professional licensed tour guide in preferred language). 3 night 4 or 5 star hotel accommodation including breakfast at the hotel (3 night in Kusadasi). Tour itinerary includes 3 breakfast, 4 lunch and 3 dinner. Transportation by fully air-conditioned, nonsmoking vehicles such as Mercedes Vito, Sprinter & Bus. 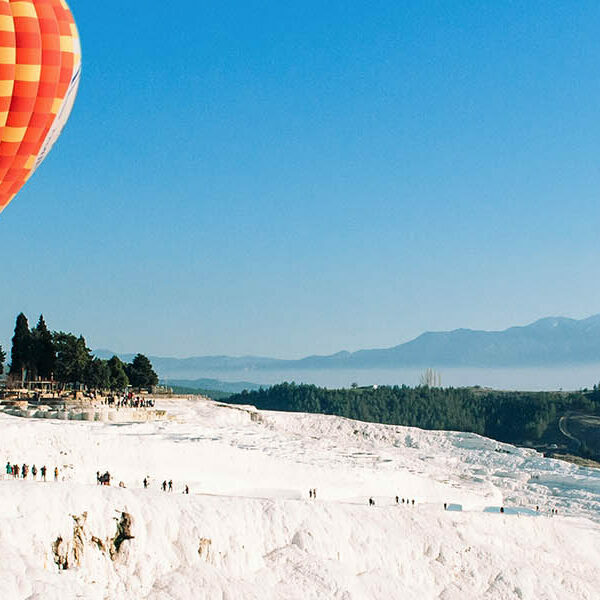 After having breakfast at the hotel, we will journey inland to Pamukkale to enjoy the spas, pools, and terraces of this natural wonder, called the Cotton Castle. 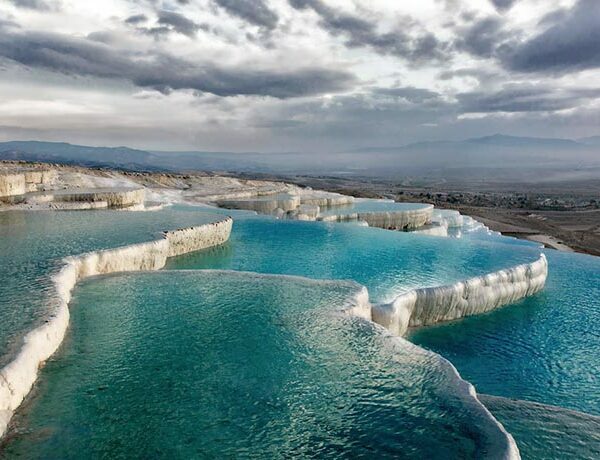 This name is truly fitting, the brilliant white calcified terraces do truly resemble a castle made of cotton. We will also spend time in Hieropolis, with one of the largest and most diverse necropolis in the world. After the tour, we will return to your hotel in Kusadasi for dinner and overnight stay. After having breakfast at the hotel ,depart for the first ancient city; Priene which in its time was one of the most spectacular of all the ancient Ionians cities. Then travel on to Miletus with its magnificent theatre and the Byzantine fortress on the acropolis above. Last, but not least, visit Didyma. Here you will find the largest Ionic Temple in the world, that of Apollo. Also in Didyma lies the huge, cracked head of Medusa which long ago fell from the frieze. Lunch is included in the tour. After tour, drive back to our hotel. Overnight stay in Kusadasi. After having breakfast at the hotel, we will depart for a full day tour of Ephesus and Virgin Marys House. First, we will visit the ruins of the Temple of Artemis, one of the seven wonders of the ancient world. Then proceed to the Ancient City of Ephesus where you will explore some of the best preserved theatre, fountains and buildings in the world. Then we will continue to the House of Virgin Mary on top of the mountain. A pilgrimage site for many people of all denominations. 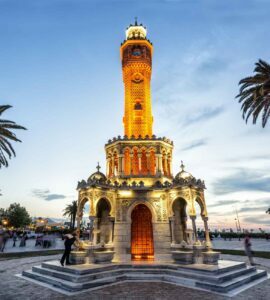 After the tour, we will transfer you to Izmir International Airport to take the flight back to Istanbul. 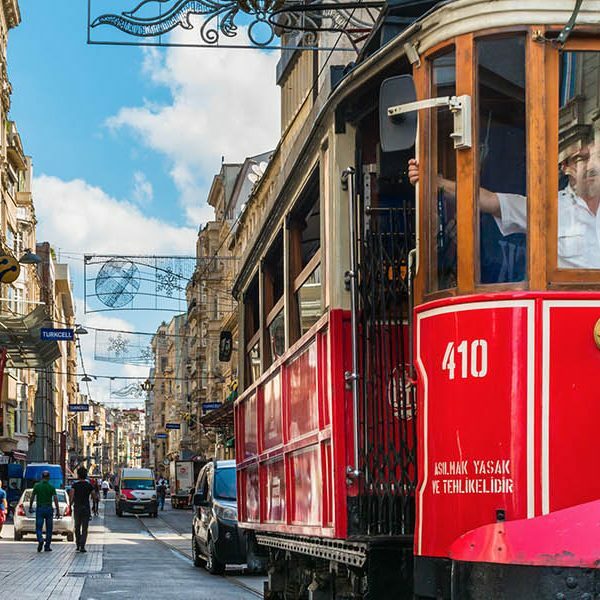 Upon your arrival to Istanbul we will transfer you to your hotel. End of our services. Tayf Tours the best option for Turkey! I was in Turkey last August with my wife. We made many request for tours with places where we wanted to visit in this wonderfull country. After many questions and answer, we finally found the people from Tayf Tours with excelent responses not only for issues regarding the tour but also advices and real time information about the isolate situation in some parts of the country. 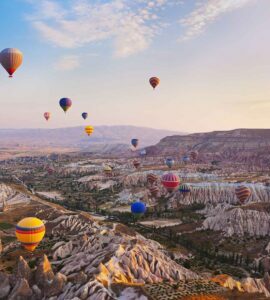 The tour was wonderfull, we visited many places in Capadocia region including the balloon trip, then we were in Pergamon, Hierapolis, Pamukkale. Apart of the places, the hotels and transportation used in our journey were very good. Thanks Tayf Tours for making our vacation in Turkey an unforgettable experience!